This one of a kind layered boho necklace set is gorgeous! If your aesthetic is modern boho, this baby is for you! The longer necklace stars a rustic oval grey and white agate geode accented by grey jasper beads and matte gold plated hammered spheres. 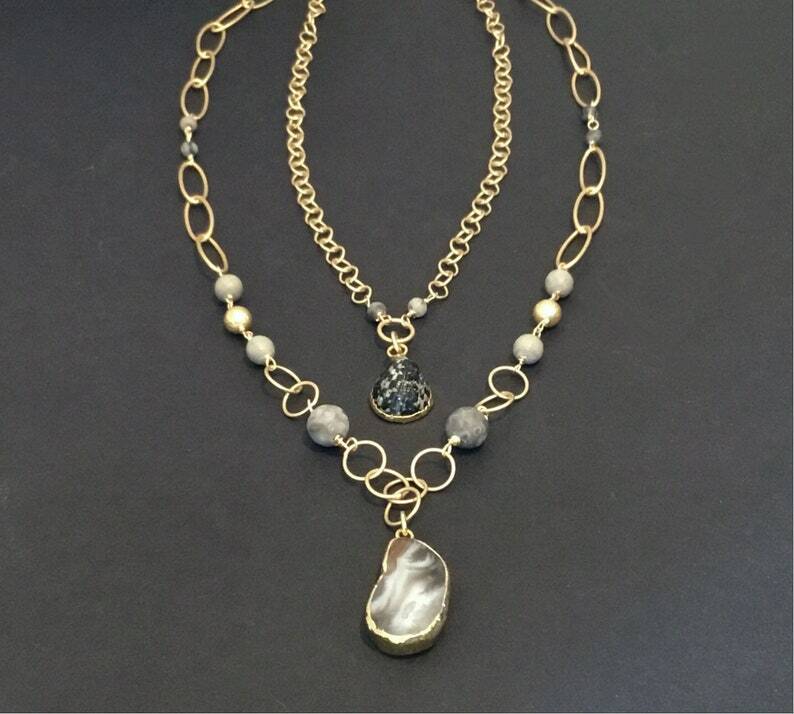 The shorter necklace is a nod to warmer weather, with a tiny black spotted shell pendant trimmed in gold plating. A beautiful, one of a kind combo that will get you loads of compliments! Perfect with black or white tee, or even a a LBD. Comes beautifully boxed and ready to gift too! Please select at checkout. If you would like chain lengths that aren’t offered in the drop down menu, select “custom” in the drop down and leave your preferences in the notes at checkout.